As if assembling a pump system wasn’t difficult enough, there are a number of pumps that can be employed and each of them has specialties and weaknesses. If you’ve ever worked with a pump system in the past you probably understand how dangerous an improperly assembled system and improper assembly starts with a lack of understanding of the components making up the system, can be. This article will explore the function, strengths, and weaknesses of the Flojet Diaphragm Pump and diaphragm pumps in general, as well as offer a little bit of the history of such pumps. 1. How Do Flojet Diaphragm Pumps Function? a. Hydraulic diaphragm pumps function by having a rubber seal separate the fluid that needs to be pumped from a reservoir of hydraulic fluid or air. The hydraulic fluid will be pressurized in such a way that it stretches the rubber, the release of which pulls fluid into the pump. The next stretch of the rubber will push fluid out and pull more fluid into the pump. a. 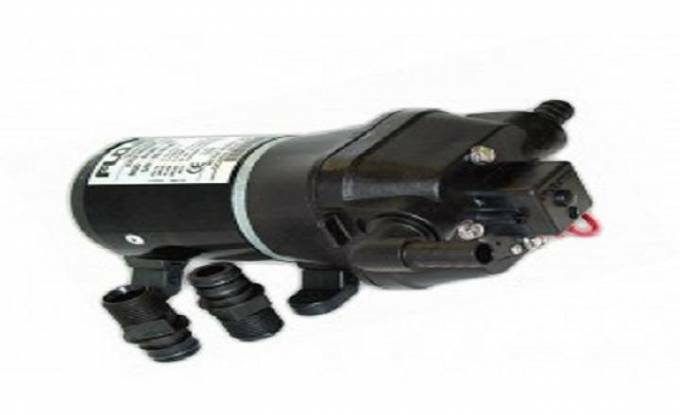 This type of pump functions by having a mechanical component that interacts with the rubber diaphragm. The mechanical component stretches the rubber of the diaphragm and causes the initiation of the pumping action. a. Dual diaphragm pumps employ two diaphragms, each with an opening to pump fluid on its side of the pump. The pump is activated by stretching one of the diaphragms, which then causes the other diaphragm to react. In this way, this type of pump utilizes its own energy to continue pumping liquid on both sides of the pump. Diaphragm pumps create a seal that separates the liquid from the rest of the mechanism, which is actually where a number of their strengths come from. 2. What Are the Strengths of Flojet Diaphragm Pumps? Because diaphragm pumps form hermetic seals, they do not generally require lubricants for the pump itself (though, of course, any connected machines may require lubricants). This makes maintenance of diaphragm pumps considerably easier, and also grants advantages in situations where having lubricants within the pump simply isn’t viable. The seal also grants a great boost to safety for this type of pump in regards to accidental leaking. Diaphragm pumps are most commonly used to transfer hazardous chemicals since they have a very low chance of leaking and are able to pump fluids without having potentially compromising spaces or interlocking pieces. Diaphragm pumps are also remarkably good at handling viscous fluids and/or fluids with particulate contained within. Diaphragm pumps are therefore often employed to pump sludge or chemicals that would gum up other types of pumps. 3. What Is the History of Flojet as a Product? Flojet was founded in 1975 to design and manufacture special use pumps, primarily focused around machines used for cleaning (car wash pumps, soap pumps, and more). It is now one of the world’s largest suppliers of smaller industrial pumps and pump parts. Flojet was acquired by Xylem in 2011 when Xylem separated from ITT Corporation. Xylem is now a multi-billion dollar company offering incredible solutions for water transportation, pump analysis, and industrial water needs. Xylem offers water products internationally as well. 4. What Applications Are There for Flojet Pumps? Flojet designs pumps for a great number of applications, some of which might surprise you. In the foodservice industry, Flojet diaphragm pumps can be used to dispense beverages of all types including alcoholic beverages, carbonated sodas, and coffee. Additionally, certain models of Flojet diaphragm pumps are designed to pump thicker fluids, such as flavor syrups and juices. Not all pumps can handle these types of fluids, which are often viscous and/or acidic. Flojet also designs pumps for food as well, largely for food processors. Since their diaphragm pumps are some of the best in the industry, many canning companies, wineries, and food processor designers employ Flojet pumps to transport difficult to pump materials like honey, grape pulp, and melted cheese. Another possibly surprising industry that Flojet operates in is health and beauty. Flojet does not make a great amount of diaphragm pumps for health and beauty, however, they do design pumps that assist in the pharmaceutical manufacturing process as well as pumps for personal care products. Finally, and most importantly, Flojet designs chemical, automotive, and marine pumps for all kinds of purposes. From pumping lubricants and fluids in your vehicle engine to emptying bilge water and handling on-boat water pressure, Flojet develops some of the best pumps for mechanical use. Interested in integrating a Flojet pump? Visit us TODAY to get set up at industrialzone.com! For more information about Kunkle Safety Valve and Lmi Pumps Suppliers Please visit : Industrialzone.